A warning to everyone on Internet, especially to those of you who called yourselves Christians, Jewish, Messianic Jewish, also those who called themselves “following the GOD of Abraham, Isaac and Jacob”. No matter whether you acknowledge YAHUSHUA (aka YAHSHUA / YAHSHA / YESHUA ha MASHIACH, or Jesus Christ / Yesus Kristus / Iesous / Iesu Kirisuto) as Messiah or rejected YAHUSHUA, I want you all to discern carefully the teaching of the so-called Prophecy 89 and 90 of amightywind.com or almightywind.com, some of you might have even watched such videos from youtube.com, the same warning is also for you all! Attention! This is NOT about whether RUACH ha KODESH (Holy Spirit) is a HE or a SHE. If you want to know that, you can dig the Scriptures in original language, which some claim in Hebrew, and some others claim in Aramaic. Ask those who TRULY read Hebrew or Aramaic Bible about that topic. What will be shown here is something MORE important than the topic about “gender”. Make sure you keep reading through this page. This will be a very long page, but read and discern carefully. Elisabeth, when you rock and you pray, it is ME that rocks you. Keep striving to know who I am. I will reveal more to you. I will bring you remembrance of what it was like in Heaven when you beheld MY Face. For I sit next to your Heavenly Father. YAHUVEH is MY HUSBAND. YAHUSHUA is MY Son. There is not only one throne, there are three thrones in Heaven and WE rule in unison. How do you think your prayers reach your ABBA YAHUVEH’s ears? It is I that send them to HIM for I am in the Believers, those who love MY Son, YAHUSHUA. It is I, the anointed WIND that blows them to HIM (YAHUVEH) as I blow a kiss to Heaven. I speak in symbolism so you can understand. When you lift up prayer, it’s like blowing kisses to your ABBA YAHUVEH. When you pray in MY Son’s Name, it takes all three of us for you to be heard and answered. This is just the beginning of the teaching. 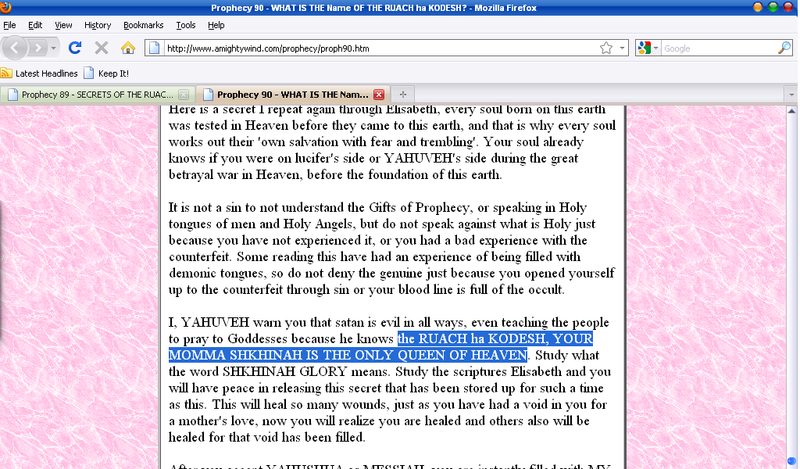 RUACH ha KODESH is WHATTT??? Where do you think the idea came from that a Holy husband and wife were to be one? It was first done in Heaven. When you accepted YAHUSHUA as MESSIAH, you never realized at the same time you were being filled with a Heavenly Mother’s love. The word ‘comforter,’ is what a Mother does best. I am your MOMMA RUACH ha KODESH and I am your comforter, I soothe you when you need soothing, when your emotions are raw, and you are hurting, fearful, lonely or feeling rejected or confused. I am the peace that passes all understanding. I am the RUACH ha KODESH your MOMMA SHKHINAH that gives you Holy Heavenly Motherly love. so you're questioning where the idea came from, oh amightywind.com? 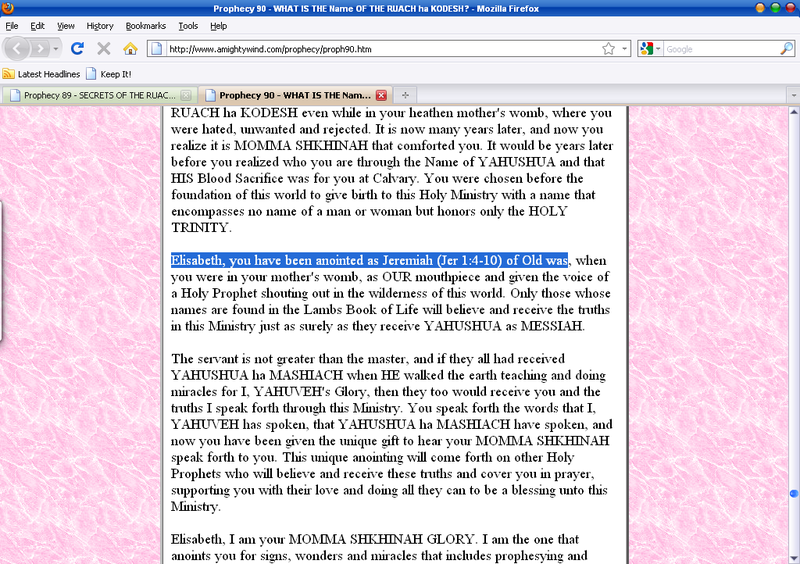 Elisabeth, you have been anointed as Jeremiah (Jer 1:4-10) of Old was, when you were in your mother’s womb, as OUR mouthpiece and given the voice of a Holy Prophet shouting out in the wilderness of this world. Only those whose names are found in the Lambs Book of Life will believe and receive the truths in this Ministry just as surely as they receive YAHUSHUA as MESSIAH. I give you the answer now, it was I your MOMMA SHKHINAH, your MOMMA WISDOM (In Greek wisdom is translated to Sophia) this is why you have never grieved again or felt the void of never knowing a mothers love. Every baby is born with a desire and a need for a Mother and a Father’s love, because all humans are born as babes with a need of earthly love and protection of a Mother and a Father. It is MY LOVE that you basked in as you sat at the Banquet Table in Heaven with ME and your Heavenly ABBA YAHUVEH waiting for the others to join you. MY love and presence enveloped you, as I am your HOLY Mother; I am the only QUEEN of Heaven, there is none other. You know the Name of YAHUVEH; you know the Name of YAHUSHUA ha MASHIACH, now through this Ministry and this Ringmaiden, I now share MY Name as MOMMA SHKHINAH your MOMMA WISDOM. MY Name is reserved for those who desire to grow, bask and be mentored more in MY Heavenly Mother’s love and a stronger HOLY SPIRIT anointing, MOMMA SHKHINAH is MY Name. I am the still small voice that speaks in the Holy Wind, and ignites you with anointed HOLY FIRE; this is why your body heats up under MY anointed touch. I am YAHUSHUA’s comforter and HIS Heavenly Mother. YAHUSHUA is MY begotten Son as much as YAHUVEH’s begotten Son. I am the only Queen of Heaven. Do not give that title to any other. Again, for the third time, can you believe that? I, YAHUVEH warn you that satan is evil in all ways, even teaching the people to pray to Goddesses because he knows the RUACH ha KODESH, YOUR MOMMA SHKHINAH IS THE ONLY QUEEN OF HEAVEN. Study what the word SHKHINAH GLORY means. Study the scriptures Elisabeth and you will have peace in releasing this secret that has been stored up for such a time as this. This will heal so many wounds, just as you have had a void in you for a mother’s love, now you will realize you are healed and others also will be healed for that void has been filled. 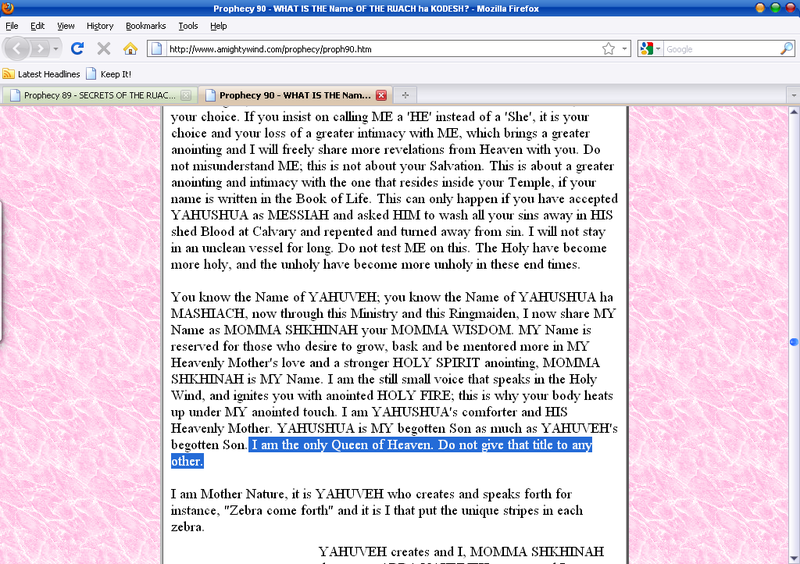 wow ... for the third time, now with YAHUVEH name as the one saying it! 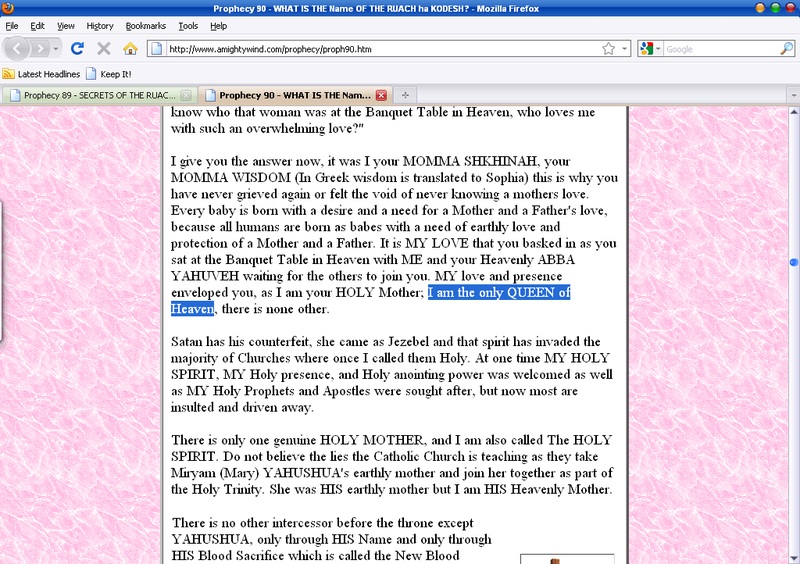 – who is YAHWEH’s wife? – who is the Queen of Heaven? – why there has been such an idea to create man and woman? 1 They say, If a man put away his wife, and she go from him, and become another man’s, shall he return unto her again? shall not that land be greatly polluted? but thou hast played the harlot with many lovers; yet return again to me, saith the LORD. 3 Therefore the showers have been withholden, and there hath been no latter rain; and thou hadst a whore’s forehead, thou refusedst to be ashamed. 1 At the same time, saith the LORD, will I be the God of all the families of Israel, and they shall be my people. 2 Thus saith the LORD, The people which were left of the sword found grace in the wilderness; even Israel, when I went to cause him to rest. 3 The LORD hath appeared of old unto me, saying, Yea, I have loved thee with an everlasting love: therefore with lovingkindness have I drawn thee. 4 Again I will build thee, and thou shalt be built, O virgin of Israel: thou shalt again be adorned with thy tabrets, and shalt go forth in the dances of them that make merry. 5 Thou shalt yet plant vines upon the mountains of Samaria: the planters shall plant, and shall eat them as common things. 6 For there shall be a day, that the watchmen upon the mount Ephraim shall cry, Arise ye, and let us go up to Zion unto the LORD our God. 7 For thus saith the LORD; Sing with gladness for Jacob, and shout among the chief of the nations: publish ye, praise ye, and say, O LORD, save thy people, the remnant of Israel. 8 Behold, I will bring them from the north country, and gather them from the coasts of the earth, and with them the blind and the lame, the woman with child and her that travaileth with child together: a great company shall return thither. 9 They shall come with weeping, and with supplications will I lead them: I will cause them to walk by the rivers of waters in a straight way, wherein they shall not stumble: for I am a father to Israel, and Ephraim is my firstborn. 10 Hear the word of the LORD, O ye nations, and declare it in the isles afar off, and say, He that scattered Israel will gather him, and keep him, as a shepherd doth his flock. 11 For the LORD hath redeemed Jacob, and ransomed him from the hand of him that was stronger than he. 12 Therefore they shall come and sing in the height of Zion, and shall flow together to the goodness of the LORD, for wheat, and for wine, and for oil, and for the young of the flock and of the herd: and their soul shall be as a watered garden; and they shall not sorrow any more at all. 13 Then shall the virgin rejoice in the dance, both young men and old together: for I will turn their mourning into joy, and will comfort them, and make them rejoice from their sorrow. 14 And I will satiate the soul of the priests with fatness, and my people shall be satisfied with my goodness, saith the LORD. 15 Thus saith the LORD; A voice was heard in Ramah, lamentation, and bitter weeping; Rahel weeping for her children refused to be comforted for her children, because they were not. 16 Thus saith the LORD; Refrain thy voice from weeping, and thine eyes from tears: for thy work shall be rewarded, saith the LORD; and they shall come again from the land of the enemy. 17 And there is hope in thine end, saith the LORD, that thy children shall come again to their own border. 18 I have surely heard Ephraim bemoaning himself thus; Thou hast chastised me, and I was chastised, as a bullock unaccustomed to the yoke: turn thou me, and I shall be turned; for thou art the LORD my God. 19 Surely after that I was turned, I repented; and after that I was instructed, I smote upon my thigh: I was ashamed, yea, even confounded, because I did bear the reproach of my youth. 20 Is Ephraim my dear son? is he a pleasant child? for since I spake against him, I do earnestly remember him still: therefore my bowels are troubled for him; I will surely have mercy upon him, saith the LORD. 21 Set thee up waymarks, make thee high heaps: set thine heart toward the highway, even the way which thou wentest: turn again, O virgin of Israel, turn again to these thy cities. 22 How long wilt thou go about, O thou backsliding daughter? for the LORD hath created a new thing in the earth, A woman shall compass a man. 23 Thus saith the LORD of hosts, the God of Israel; As yet they shall use this speech in the land of Judah and in the cities thereof, when I shall bring again their captivity; The LORD bless thee, O habitation of justice, and mountain of holiness. 24 And there shall dwell in Judah itself, and in all the cities thereof together, husbandmen, and they that go forth with flocks. 25 For I have satiated the weary soul, and I have replenished every sorrowful soul. 26 Upon this I awaked, and beheld; and my sleep was sweet unto me. 27 Behold, the days come, saith the LORD, that I will sow the house of Israel and the house of Judah with the seed of man, and with the seed of beast. 28 And it shall come to pass, that like as I have watched over them, to pluck up, and to break down, and to throw down, and to destroy, and to afflict; so will I watch over them, to build, and to plant, saith the LORD. 29 In those days they shall say no more, The fathers have eaten a sour grape, and the children’s teeth are set on edge. 30 But every one shall die for his own iniquity: every man that eateth the sour grape, his teeth shall be set on edge. 37 Thus saith the LORD; If heaven above can be measured, and the foundations of the earth searched out beneath, I will also cast off all the seed of Israel for all that they have done, saith the LORD. 38 Behold, the days come, saith the LORD, that the city shall be built to the LORD from the tower of Hananeel unto the gate of the corner. 39 And the measuring line shall yet go forth over against it upon the hill Gareb, and shall compass about to Goath. 40 And the whole valley of the dead bodies, and of the ashes, and all the fields unto the brook of Kidron, unto the corner of the horse gate toward the east, shall be holy unto the LORD; it shall not be plucked up, nor thrown down any more for ever. Have you read through the whole Jeremiah verses above? 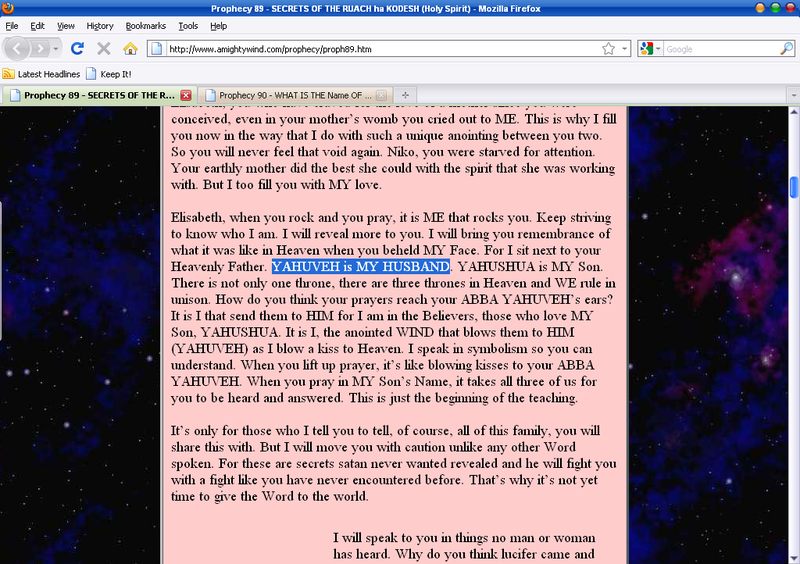 Is there anything you don’t understand about to whom YAHWEH has addressed as HIS wife? 28 Yet a small number that escape the sword shall return out of the land of Egypt into the land of Judah, and all the remnant of Judah, that are gone into the land of Egypt to sojourn there, shall know whose words shall stand, mine, or their’s. Again, you do read the whole text above, right? The Queen of Heaven has been addressed as “other gods”. That’s what has been written inside the book of Jeremiah, I repeat, Jeremiah. If you have truly checked what Genesis really says, is there any part you still don’t understand about why YAHWEH created man and woman as husband and wife? Now, with all those three points above, who has truly told you about the REAL GOD of Abraham, Isaac and Jacob then? Readers, audience of youtube, those who are supporting amightywind.com or almightywind.com, including those who have translated their so-called prophecies, dreams and teaching. I want to ask you, People, who has told us the truth now? 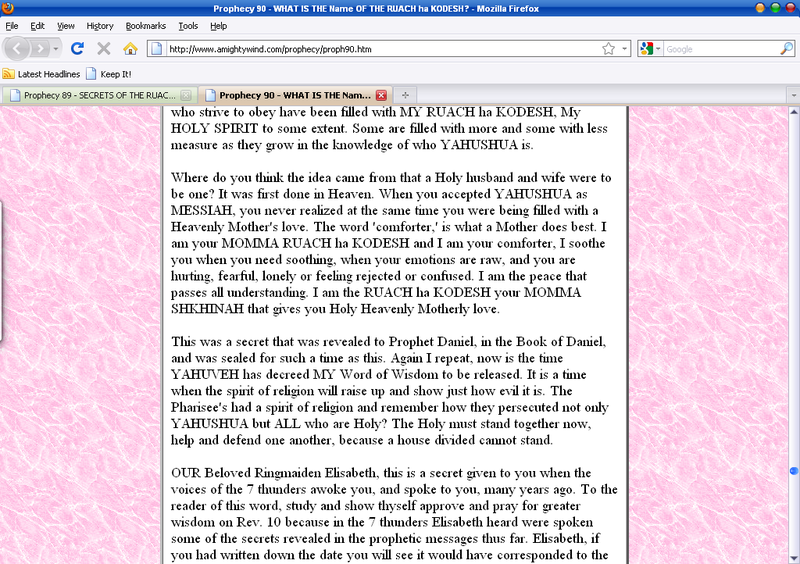 The Scriptures, or the so-called prophet Elisabeth Elijah Nikomia of amightywind.com / almightywind.com?? And what the Scriptures said about such things in the so-called Prophecy 89 and 90 of amightywind.com / almightywind.com? These are what the Scriptures said to us! So, do those people in amightywind.com / almightywind.com hear from YAHWEH? Do they lead us to the real GOD and the real RUACH ha KODESH? Do those people really keep YAHWEH’s Ten Commandments? If you have checked the Scriptures, you will know who has truly told us the truth. Warning: read all the verses yourself in your Bible, Everyone. do you think these sites are telling us the truth? from aceboard.net: Has Anyone Taken a Close Look at this Ministry?